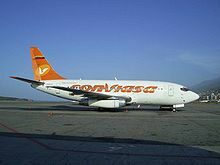 Conviasa (legally Consorcio Venezolano de Industrias Aeronáuticas y Servicios Aéreos, S.A., "Venezuelan Consortium of Aeronautics Industries and Air Services") is an airline with its headquarters on the grounds of Simón Bolívar International Airport in Maiquetía, Venezuela, near Caracas. It is the flag carrier and largest airline of Venezuela, operating services to domestic destinations and to destinations in the Caribbean and South America. In January 1997, Venezuela's former flag carrier, Viasa, ceased operations after 37 years of service due to prolonged financial problems. In May 2001, the idea to create a new flag carrier for Venezuela was proposed, but in December 2002, the project was put on hold until 1 October 2003. On 30 March 2004, then President of Venezuela, Hugo Chávez, signed a decree that formally established the airline. This decree was published in the nation's official gazette the next day. On 28 November 2004, Conviasa's inaugural flight was made with a De Havilland Canada Dash 7 aircraft flying from the airport in Charallave to the Santiago Mariño International Airport, on Margarita Island. On 10 December 2004, Conviasa formally began its national and international operations. Conviasa was originally run by the now defunct Ministry of Production and Commerce (Ministerio de la Producción y el Comercio), but it has since been taken over by the Ministry of Infrastructure. On 17 April 2006, José David Cabello Rondon replaced Wilmer Castro Sotelo as head of Conviasa. On 30 June 2006, Jose David Cabello Rondon replaced Ramon Alonzo Carrizalez Rengifo as the Minister of Infrastructure and on 18 July 2006, Franklin Fernandez Martinez became president of Conviasa. Following the Flight 2350 crash, on September 17, 2010, the government of Venezuela grounded all Conviasa flights so that it could perform a technical review of the airline's fleet. The airline said that the temporary suspension would remain in effect until October 1, 2010. Flights have since been re-instated. Decree No. 7838 of the Official Gazette No. 39,558 published on Wednesday, provides for the appointment of Colonel citizen (AVB) Jesús Rafael Viñas García, President of the Venezuelan Consortium Trading Company Aircraft Industries and Air Services SA (CONVIASA) under the Ministry of Popular Power for Transportation and Communications. On 3 April 2012, Conviasa has been banned from flying to countries in the European Union because of safety concerns. It said that Conviasa failed to show it had taken adequate steps to prevent future accidents, but had this restriction lifted on 10 July 2013. Conviasa is under the authority of the Ministry of Aquatic and Air Transport. The airline is owned by the Venezuelan government (80%) and the regional government of Nueva Esparta (20%). Conviasa has its headquarters on the grounds of Simón Bolívar International Airport in Maiquetía, Venezuela, near Caracas. Originally Conviasa had its headquarters on Margarita Island. At one time Conviasa had its headquarters in the East Tower of Parque Central in Caracas. In August 2016, it has been reported that over 80 percent of Conviasa pilots quit their jobs due to low and outstanding payments and the airline had to reduce operations down to around 16 flights per day subsequently. Additionally, several of the company's aircraft have been stored unused since several months. On 5 May 2017, Conviasa was forced to suspend all international operations due to a lack of foreign currency to pay for international aircraft insurance. Also in May 2017, Wamos Air terminated its contract with Conviasa on short notice. Wamos Air operated a single Boeing 747-400 for Conviasa between Caracas and Madrid. On 15 December 2005, Conviasa flight 2600, a De Havilland Canada Dash 7 with 36 passengers and 4 crew members on board, was forced to make a belly landing at Porlamar's airport when the landing gear failed to deploy. After circling Porlamar for an hour and a half to burn off fuel, the aircraft touched down without any injuries. On 30 August 2008, a Boeing 737-200 took off from Caracas's Maiquetia airport, Venezuela, and was bound to Latacunga, Ecuador, 80 kilometers (50 miles) south of Quito. Three crew members (a captain, a first officer and a mechanic) were on board. The plane crashed in mountainous area in Ecuador’s Andes, killing all the three people on board. The Boeing 737 had been stored for a while at Caracas. It was being ferried to Latacunga, reportedly underway to a new owner. On 13 September 2010, Flight 2350, an ATR 42-300 (registration YV1010), with 47 passengers and 4 crew on board, crashed shortly before landing. It was a domestic scheduled passenger flight from Del Caribe "Santiago Mariño" International Airport, Porlamar, Isla Margarita to Manuel Carlos Piar Guayana Airport, Ciudad Guayana. There were 34 survivors and 17 fatalities. ^ Neuman, William (4 April 2012). "Venezuela: Airline Banned by Europe". The New York Times. ^ "Organigrama." (Archive) Ministry of Aquatic and Air Transport. Retrieved on April 17, 2012. ^ "Sede Principal[permanent dead link]." Conviasa. Retrieved on May 9, 2010. "Av. Intercomunal Aeropuerto Internacional de Maiquetía Edf. Sector 6.3, Zona Estratégica, Lado Este del Aeropuerto Internacional de Maiquetía, Adyacente a Tránsito Terrestre. Venezuela." ^ Bloomberg News and Wire Reports. "GLOBAL BUSINESS." South Florida Sun. March 12, 2004. 3D. Retrieved on May 9, 2010. "Conviasa which will have headquarters on the tourist island of Margarita." ^ "Contactos." Conviasa. July 11, 2007. Retrieved on May 9, 2010. "Dirección Sede Principal Av. Lecuna, Parque Central, Torre Oeste, Piso 49, Caracas, Venezuela." ^ a b c "Conviasa drops Iran service; re-route Syria flight". Routesonline. 16 September 2010. Retrieved 8 March 2019. ^ "Avión de Conviasa aterrizó de emergencia en aeropuerto de Margarita". Primera-clase.com. Archived from the original on 2012-09-10. Retrieved 2013-08-31. ^ "ATERRIZAJE DE EMERGENCIA DEL YV-1003 EN MARGARITA, VENEZUELA". Rescate.com. Retrieved 2013-08-31. ^ "Plane crashes in eastern Venezuela". BBC News Online. 14 September 2010. Retrieved 13 September 2010. ^ "Crash: Conviasa AT42 near Puerto Ordaz on Sep 13th 2010, impacted terrain". Aviation Herald. 2010-09-13. Retrieved 2010-09-13. ^ "Aumentan a 17 fallecidos por accidente de avión de Conviasa - El Universal Venezuela" (in Spanish). Retrieved 14 September 2010. This page was last edited on 9 March 2019, at 00:22 (UTC).